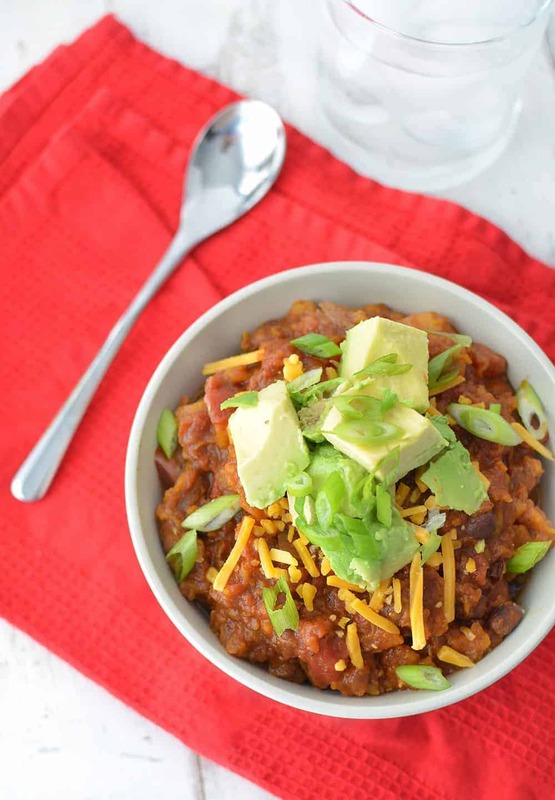 Slow Cooker Butternut Squash and Black Bean Chili! Vegan and Gluten-Free, perfect for cold nights. Put it on in the morning and dinner is ready a few hours later! Guess the temperature. It’s a silly little game that BL and I play almost daily since moving to the Arctic Circle Midwest from sunny California. It’s a nice reminder that in my eight short years of being on the west coast, I have zero clue of what cold weather feels like. Walking to brunch yesterday may have been my ultimate fail. Bundled up in my heavy-duty puffer coat, mittens and scarf, I swore temperatures couldn’t have been above 30 degrees. 52. It was 52 degrees outside and I was still a bit chilly in my coat made for negative degree weather. Um, hi, I’ll be hibernating until Spring, returning only when the groundhog says it’s safe to do so. In previous winters, I only pulled out my slow-cooker a handful of times but now that the thought of raw salad is almost unbearable, I’m putting it to good use. Since soup season is in full swing, I wanted to adapt my favorite chili recipe for the crockpot. 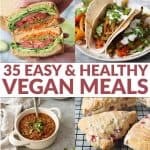 It’s vegetarian/vegan, gluten-free and super-easy to make. It’s hearty, comforting and the only remedy for days when I’m too cold to venture outdoors. For an extra layer of flavor, I lightly saute the onion, garlic, peppers and squash before adding to the soup. This step caramelizes the onion and produces a lightly browned crust to the squash and peppers. But, I totally understand if that two step process seems daunting on busy days; in that case- just load everything in at once and cook until tender. 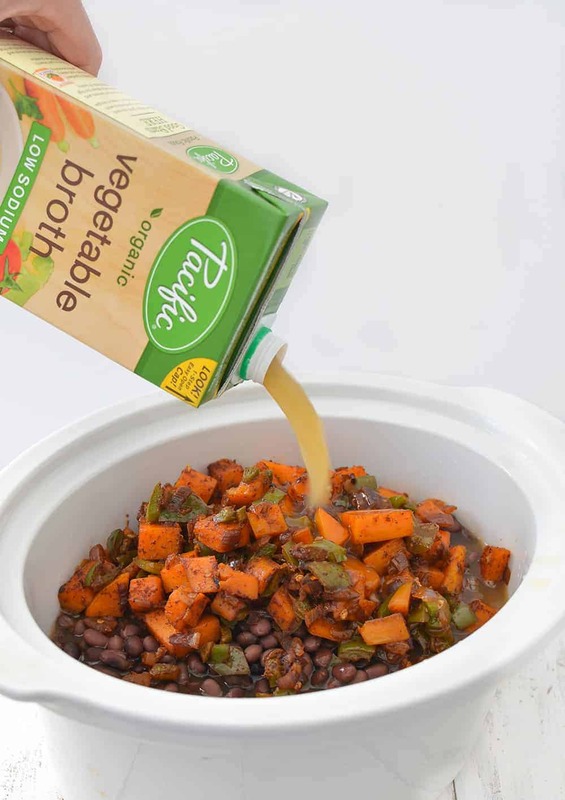 Once the beans and cooked vegetables are in, pour over Pacific Foods low-sodium organic vegetable broth. I’ve mentioned before how much I love this broth, and it’s my secret weapon in soups, chilis and creamy sauces. 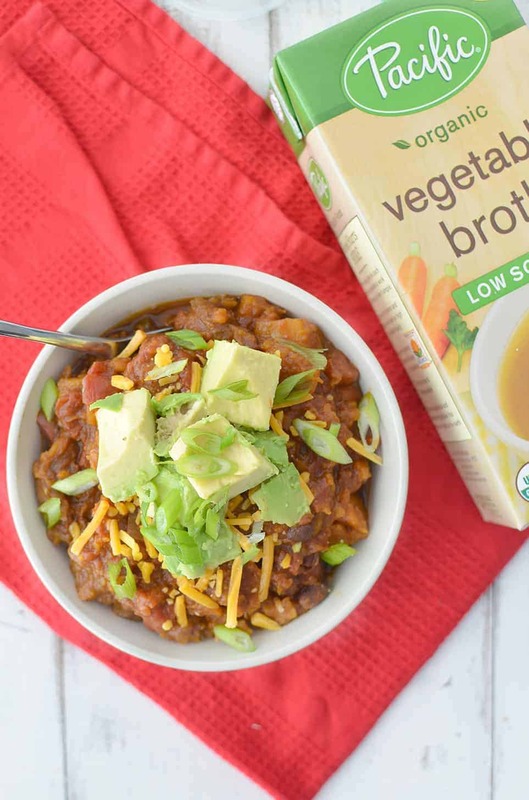 It’s hard to find a vegetable broth that tastes delicious, is organic, low-sodium and doesn’t contain added fillers or MSG. Pacific meets all my requirements and it’s why I continue to both use it and promote it. 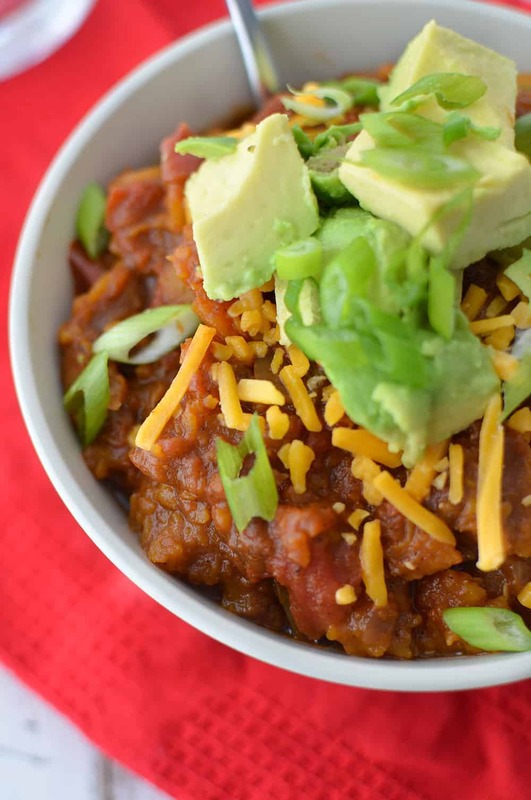 Of course, no chili is complete without toppings. 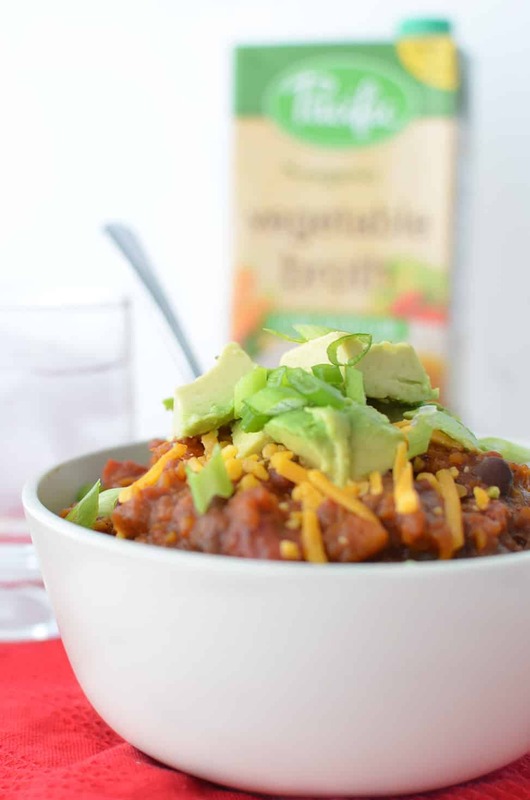 I seriously think that’s my favorite part about chili- an excuse to pile on chopped avocado. Personally, I think the combo of spicy chili and creamy avocado tastes best, but go with whatever your heart desires. So, to recap. 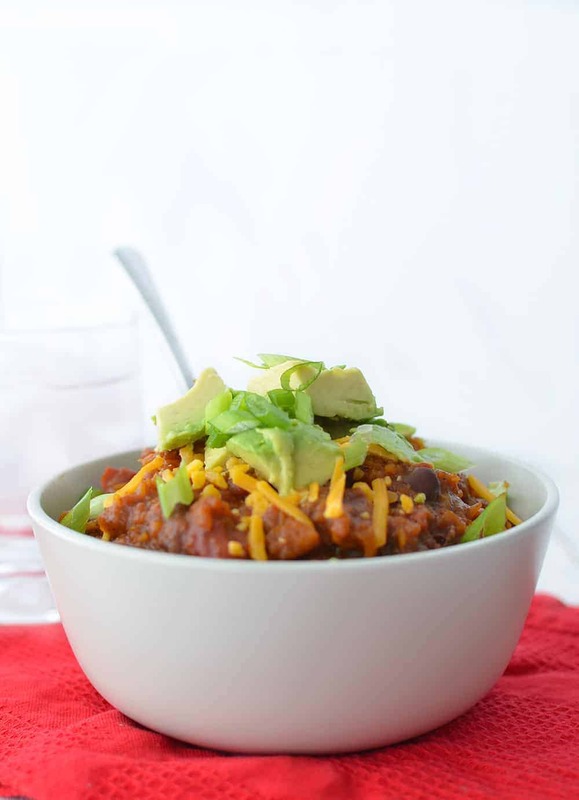 Freezing temps = warm bowls of homemade, meatless chili. Preferably in the slow-cooker so you can spend more time cuddled on the couch under a pile of blankets. 2–3 cups Pacific Foods Organic Vegetable Broth (regular or low sodium)– see notes. Heat 1 tablespoon olive oil in medium saucepan over medium heat. Add the onion and cook for 5 minutes, until tender. Stir in the minced garlic cloves, jalapeno and chopped bell pepper and cook for another 2-3 minutes, until pepper is soft. Add the cooked pepper and onion mixture to the slow cooker along with the butternut squash, chili powder, cayenne, cumin, cinnamon, black beans, broth and tomatoes. To make on the stove top, add remaining ingredients to the cooked onion mixture and simmer for 60-75 minutes until squash is soft and chili is thick. A reader noted that this recipe had too much liquid. I find that 3 cups works for my slow cooker, but it could be a variance in appliances. Make sure you don’t add any liquid from the beans. Therefore, I recommend starting with 2 cups broth and cook, if you find that you need more, add as needed. 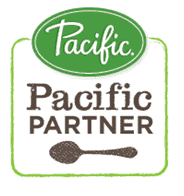 Disclaimer: I am a Pacific Foods Partner. Thanks for supporting brands that make DK possible. I only promote and support brands that I use and love. This looks delicious! Love the use of butternut! Love bean and veggie chilis!! Well at least this will not fail to warm you right up! I had to laugh out loud reading this…I grew up in Michigan and moved to Miami, FL for two years. When we moved back I really didn’t know how I was going to survive when I thought it was in the negative digits when it was really 40 degrees out! This chili looks delish, by the way! Your photos are flawless! Love the recipe! It was delicious. But….entirely too much liquid. Mine was more soup than chili; has anyone else encounter this issue. Recipe called for 3 cups broth in addition to the liquid in the 28 ounce can of tomatoes. Tradional chili recipes don’t call for that much liquid. Was it a misprint in the recipe? Hi Becky- thanks for the comment and email- I remade it again last night to check and ended up using 2 1/2 cups and it was quite thick. I wonder if your slow cooker didn’t get hot enough to evaporate some of the liquid? I’ll make the edit in the notes for others. Excellent! 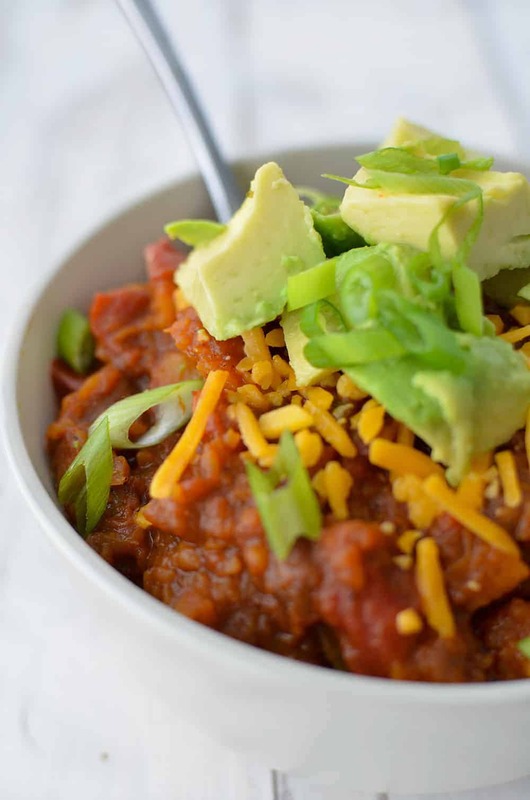 My family loved this chili! So glad to hear that! It’s one of our favorites as well. 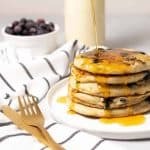 Would it possible to make this in an instant pot? It should work, though I haven’t tested it and don’t know the recommended times.